Elaina has blue eyes and brown hair, approx. 2 feet tall, weighs 21 pounds. She was last seen wearing orange shorts with flowers. Thursday, August 1, 2013 (Day 61) . Friday, August 2, 2013 (Day 62) . 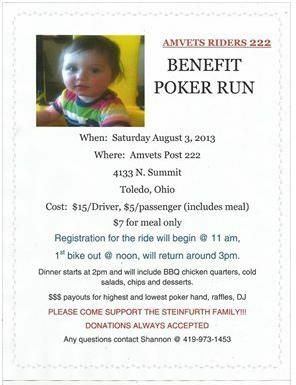 "Amvets Post 222 will host a benefit poker run and dinner on August 3rd to help support the Steinfurth family. Riders can register starting at 11 a.m. for a cost of $15/driver, $5/ passenger. Payouts will be awarded for highest and lowest poker hand. For more information on the event, contact Shannon at 419-973-1453.